Coor Service Management delivers services in both hard and soft facility management to customers in Sweden and throughout Northern and Eastern Europe. In 2015, Coor established a new division: Coor Property. They partnered with Human Univerz, a Danish change management firm and partner with Prosci, to apply the Prosci change management methodology and Appreciation at Work resources to the new division. To establish a new division and make it successful. To attract employees with the right know-how and to promote themselves towards current and potential customers. Coor Property scoped the project (the new division) from a change management perspective to make the new division a success. Five areas were defined as focus areas, including the Prosci ADKAR Model and Appreciation at Work. A special focus was brought on conscious leadership by proactively working with Prosci change management best practices research. Storytelling about the change and the ADKAR Model were used as concrete tools to focus on individuals and involve all employees in the change journey. It’s important that employees feel valued and appreciated, but if you express appreciation in ways that aren’t meaningful to your colleagues, they may not feel valued. Therefore, The Five Languages of Appreciation were implemented. The leaders made small adjustments, which made great progress in their relationship to the employees. Discover other results and details on change management application - including how the project team strengthened their employer brand and created an attractive workplace - the when you download the full story as a PDF. Coor Service Management delivers services in both hard and soft facility management to customers in Sweden and throughout Northern and Eastern Europe. 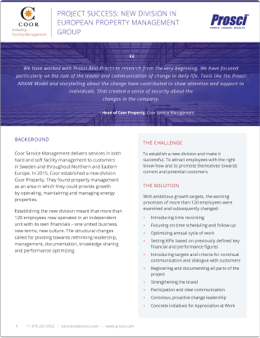 With the help of Human Univerz, a Danish change management firm and partner with Prosci, Coor created an inspiring and visionary new division.